Colorado Animal Attorneys is the animal law division of The Piccone Law Firm, LLC. 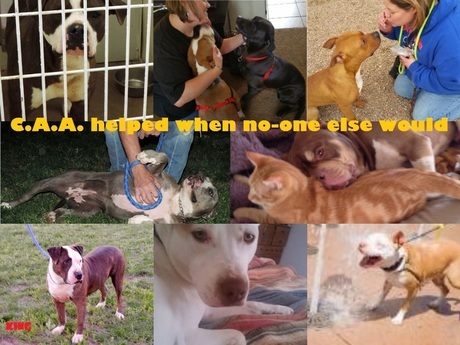 We started our practice in June 2013 and have represented guardians to save numerous dogs (and 46 cats) from being destroyed by various governmental entities. We are currently experiencing a shortfall due to a number of cases we have taken where the pets' guardians could not pay costs or cover any attorney time. The Firm makes no profit, and is merely trying to stay afloat and keep providing legal services to those who are less fortunate. Our website is www.ColoradoAnimalAttorneys.com. The pets featured here are just a few past clients. We also assist individuals in getting their pets back from people who are not legally entitled to have them and trying to obtain justice for pets who have been wrongly killed or injured by those who will not take responsibility. Much of this work has been done for free, low cost, capped or with the help of generous strangers who have contributed to help another. Colorado Animal Attorneys is the animal law division of The Piccone Law Firm, LLC. We started our practice in June 2013 and have represented guardians to save numerous dogs (and 46 cats) from being destroyed by various governmental entities. We are currently experiencing a shortfall due to a number of cases we have taken where the pets' guardians could not pay costs or cover any attorney time. The Firm makes no profit, and is merely trying to stay afloat and keep providing legal services to those who are less fortunate. Our website is www.ColoradoAnimalAttorneys.com. The pets featured here are just a few past clients. 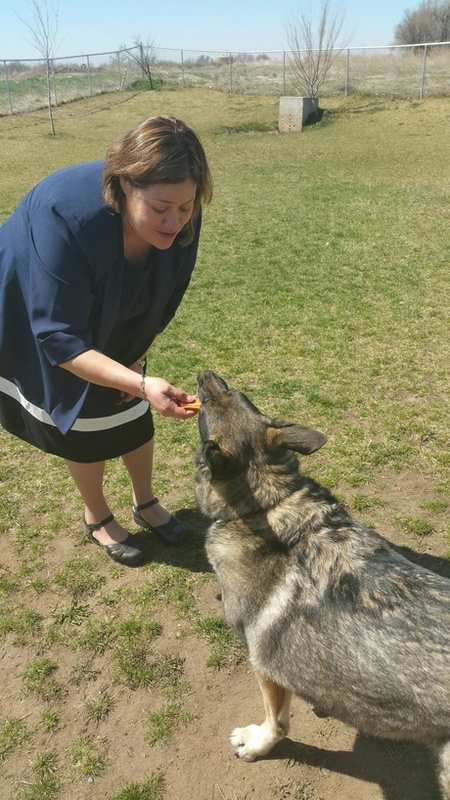 We also assist individuals in getting their pets back from people who are not legally entitled to have them and trying to obtain justice for pets who have been wrongly killed or injured by those who will not take responsibility. Much of this work has been done for free, low cost, capped or with the help of generous strangers who have contributed to help another. I take difficult, high-profile cases that most attorneys won't. Sometimes I don't get paid by the client. My firm is owed about $1500 for our representation of Jewlez, a dog facing death in Greeley CO. "lf you or we determine that fundraisers are needed for your legal matter or if you are having difficulty paying for representation, either you or we may raise funds per these terms: ...We will manage our fundraisers which will transmit funds directly into the Piccone Law Firm's PayPal or WePay accounts...Funds will be disbursed into the Piccone Law Firm's operating account when an invoice is generated (or will pay past due invoices). All contributions up to the amount of your total fees and costs will become the property of The Piccone Law Firm, LLC and will be allocated first toward attorney fees, then costs... If the representation is terminated for any reason with a balance due, the Firm retains the right to continue to promote its fundraisers until your bill is paid in full." We are so appreciative of our supporters. I'm going to start sending out thank you cards to those who have supported us in the past for this fund and many others, including my medical bill fund for my broken foot. The investigator has been paid for the Dunlap case. The firm currently has over $23,000 in accounts receivables from clients who were supposed to be on payment plans who defaulted on their promises to pay. Accordingly, we have to turn low income pet parents away weekly because we can't take any more losses or we can't stay open. In just the month of October we had to say no to at least 8 potential new clients who could not even afford to pay the $75 initial consult fee. It's been our experience that if they cannot pay that first fee they won't be able to pay the thousands of dollars it takes to pursue their case and it's a very sad reality. We are able to set aside slots for these individuals for each $75 in contributions we receive. So please consider contributing. Unfortunately I have had to turn down more people with important animal related legal questions because they could not pay my $75 consult fee. 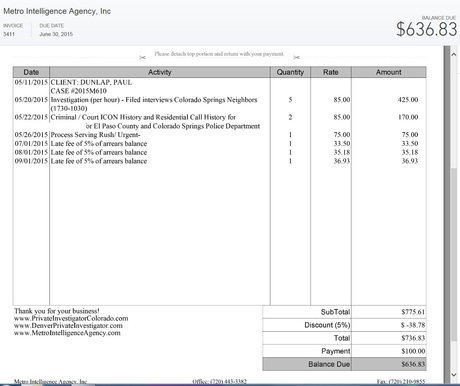 I won't be able to help any more people who can't pay until I have paid off the private investigator for the Dunlap case, who is now charging interest on top of his bill. I'll send him another $100 from the contributions I received this month, but I owe over $630 with interest. Once I've paid off his bill, I'll still need a cushion before I can help any new underprivileged pet guardians. So please help us get to $1,500. My firm simply does not make enough money to keep paying experts and providing free legal advice to those who can't pay it back. We want to put to rest a rumor that no investigator was hired for Mr. Dunlap's case. One was, and the cost of investigation and service of process was $770.00. 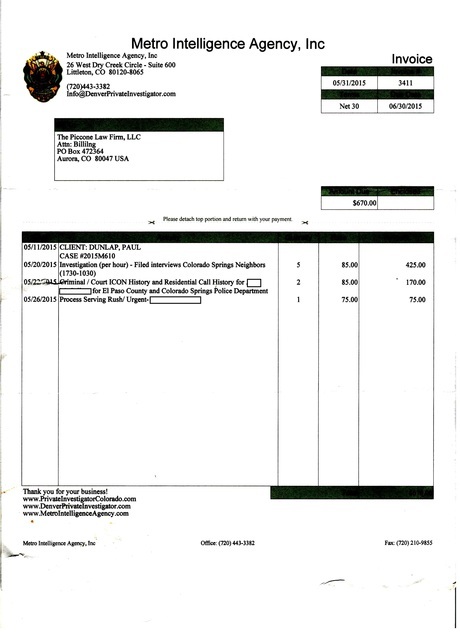 The Firm already paid one bill for $100 for service of a subpoena on Joe Stafford of HSPPR. Thanks to your contributions, we are sending another check for $100 today. This means we still owe $570.00. Mr. Dunlap did not cover these costs as he agreed to and we have as of yet been unsuccessful in raising the funds to pay these bills. The Firm put in over 160 hours into Mr. Dunlap's case (which he agreed to pay for on a payment plan). The outcome was unsuccessful due to a number of factors, lack of money and the failure of the public defender to do what he should have to prepare the case being a big part. We cannot help any more people who can't pay for their consults until we've paid off this bill and gotten at least a small cushion to cover some of our time. That's why the goal amount is $1500.00 at this time. Unfortunately we have to turn away many calls per week from people who cannot afford to pay our $75 initial consultation fee. Ms. Piccone is working on getting Animal Attorneys of the Rocky Mountains, Inc. a non-profit animal law firm, off the ground but in the meantime, she has to decline those who can't afford to pay because of the money she owes vendors for prior cases like the Dunlap case which did not raise enough funds to cover the costs or any of her fees. We are trying to raise $1500 to get the firm back on track, but until those funds are raised, we just can't provide free legal advice. Greetings! One of the things that makes our Firm different from others is we don't turn away those in need if they can't pay; unfortunately that just is not working out and the Firm has to really start being more careful with how it uses its resources. It's mid-month and we are wondering how we are going to be able to pay past due bills and payroll taxes due to a number of clients who decided not to honor their payment agreements. 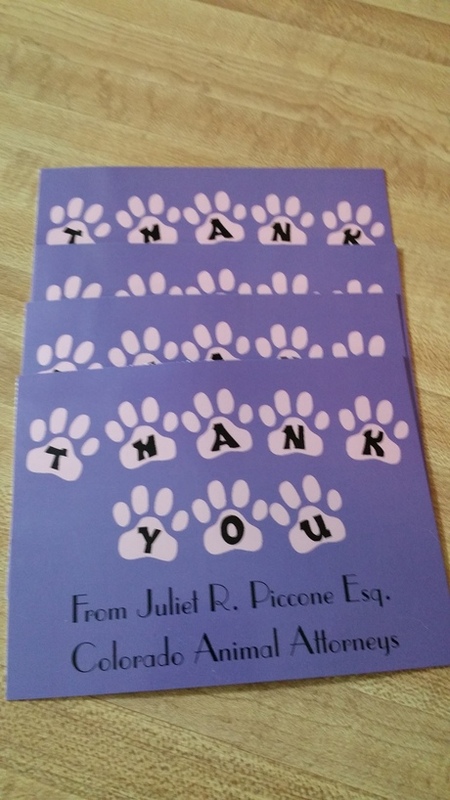 It's always stressful operating a business, but unfortunately this stress has been caused 100% by Ms. Piccone's compassion and belief that certain pet parents would repay their costs. Unfortunately, that has not happened in the past 3 months and it's catching up. If you support our work, please consider pitching in or forwarding our fund to other animal lovers. 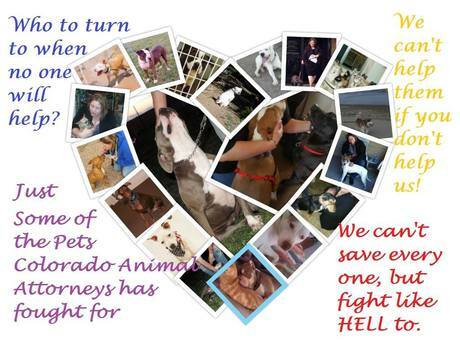 God Bless, Juliet Piccone, Esq., Founder The Piccone Law Firm, LLC dba Colorado Animal Attorneys. We trained at the HSPPR for over 8 years, did the evals for a year, and I testify as an expert witness in bitecases. DAs don't like my cv, as it is quite extensive. Check out www.coolk9s.net, and Facebook Cool K9's Dog Training. I am defending Bruno, and plan on annihilation, purely on facts. Would love to speak with you, and have no problem if you wish question me, and check my credentials. Have a wonderful evening, and let's save some dogs! 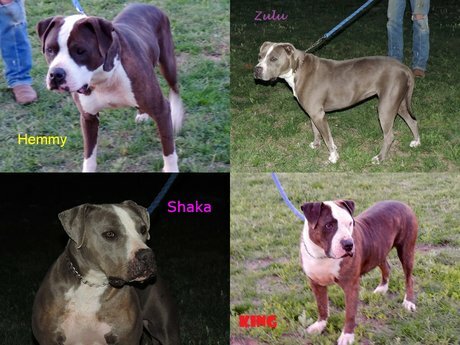 The Firm took over representation of a gentleman and his wife in El Paso County CO from the public defender in Mid April to try to save their four bully breed dogs Hemmy, Shaka, Zulu and King who were charged with being dangerous dogs and recommended to be destroyed by HSPPR and the El Paso County DA. Ms. Piccone takes seemingly hopeless cases like this because she believes even those who cannot pay a huge retainer should be given the opportunity to save their dogs. Unfortunately, after spending thousands of dollars and over 150 hours, the jury came back with a guilty verdict and the clients decided to ask for a court appointed lawyer for appeal and not make any payments to the Firm for costs or fees. The Firm has taken a huge financial loss, as well as the emotional loss of not being allowed to see the case to its conclusion. Without public support, the Firm will need to stop providing a chance to those who cannot pay up front. Betty Parks3 years ago Best wishes. Anonymous3 years ago Everyone, please donate whatever you can. This lady works hard for our pups! Thank you. Dan Luna3 years ago Best wishes. Betty Parks3 years ago Good luck! Ann Lange3 years ago Best wishes. Howard Carter3 years ago Best wishes.